Increase vocal range - 2 Simple Secrets! Ways to increase vocal range could fill a book. And this very important issue has filled many books, as we know. But now and then, we simply need to be reminded of easy, yet effective ways to release tension that can ease our way into a wider range. What I want to offer today are two simple, yet often overlooked things that you can check out for and on yourself - that can help the right muscles relax in the right way to allow the upper notes to be more accessible. We humans tend to store a lot of tension in our jaws. We clamp down on our teeth to hold back our emotions. We "set"our jaws to hide anger. We push our jaws forward to deal with scepticism. The jaw is a marvel of expression! But too much unrelieved tension there, can create problems in singing. So I sometimes will ask a student to put their hands on the hinges of their jaw and say, "Relax." Then take a nice deep breath and let it all flow out. The tongue should return to its lovely, natural position - lying quietly in the mouth, with the tip of the tongue touching on the back of the lower teeth. My dog friend is making sure that I am standing correctly for singing. She told me that my feet could be just slightly farther apart. That I should feel very well balanced and ready to move at any time. Light on my feet, yet solidly balanced. My knees are not locked. My body is loose and standing tall. In a recent quick-tip session I had online with Meribeth Dayme, voice expert and founder of Core singing, she spoke with me about the importance of a strong stance in singing. She feels that too often we stand in a weak position and that this has a powerful effect on how we sing. "People are not grounded at all in the way they are taught to sing," she said. "They come up out of themselves, instead of down into themselves - and they block the flow of their own chi." What you see in the picture is the stance that she suggests. 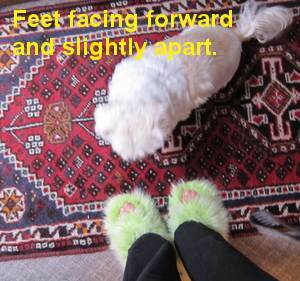 Although, for me to feel really well-balanced, I had to put my feet a little farther apart - but with feet facing straight forward. To increase vocal range, these two tips can be helpful. Reducing jaw tension and standing well are important. And i suggest that you try both. But keep in mind that it is a constellation of variables (many things) that go into singing well through out your range. Watch that you do not pull up too much chest weight in your voice as you move up the scale. Let your jaw relax and allow your vocal cords to do their job as they prepare for the lighter texture required for the upper notes. I wish you a relaxed jaw, stable footing and great singing! • Singing After Forty? Get Started On Your Dream!